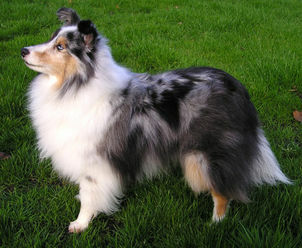 The Shetland Sheepdog, or Sheltie, is a medium sized dog with a marked resemblance to the Collie and exceptional grace. Because the muzzle is the same length as the flat skull, its head makes a long wedge when viewed from either the side or the top. The medium sized, dark eyes (occasionally the eyes can actually be blue or merle) suggest intelligence, alertness and gentility. Its small ears are held three-quarters erect, high on its head. A Sheltie's head is proudly carried on a long, supple neck that flows into a strong shoulder assembly. The shoulder blades slope forward at approximately a 35-45 degree angle, with the tops of the shoulder blades allowing just enough room for the spinal column. The shoulder blades slope slightly outward allowing ample spring of rib, with the lower portion of the ribcage meeting the elbow. Its back is level, and the deep chest features well sprung ribs that flatten in the lower half, allowing for greater mobility of the foreleg. From the side or front view the forelegs should be straight, and the hind legs should extend out (slightly) behind the set of the tail, with broad, strong thighs. The tail hangs to the hocks when at rest. and should never be carried curled up over the back. A dense, furry undercoat gives the long, straight topcoat its volume; the mane and tail are particularly full. On the face and feet the hair is smooth, and the legs are feathered. Shetland Sheepdogs may be black, blue merle or golden to mahogany sable, with white markings particularly on the muzzle, chest and feet. Height (Male) 13 - 16"
Common Misspellings Shetlend Sheepdog, Shet Land Sheep Dog or Shettland Sheepdog. Owners will find it to be an affectionate, devoted companion. It is good and patient with children and other family members, though notoriously suspicious of others. Especially wary of strange children, the Sheltie is known to bark persistently atand not allow itself to be touched bystrangers of any age. In fact, this breed may bark a lot in general. If the dog is socialized extensively when young, its owner will find it a very trainable, intelligent companion. Bred to herd, it likes to chase: take care to not let it run across a road or after a car. It will do well in an apartment if it is exercised well, though a place where it can run free is preferable. However, when allowing it to run, be sure it is in a safe area. 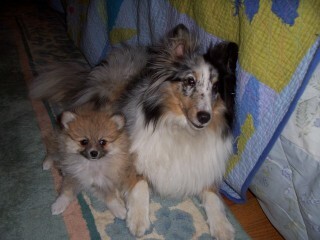 Owners should be careful not to overfeed, as Shelties that are under-exercised may become obese. Meticulous about its own cleanliness, the dog should be bathed only when absolutely necessary. Its coat should be brushed regularly, and mats should be tackled before they become unmanageable by lightly misting the coat and gently combing. The undercoat will shed in the fall and spring. The breed is susceptible to various congenital diseases, so take care to select a well bred animal. Health conditions of note include dermatomyositis, progressive retinal atrophy, canine hip dysplasia, cataracts, Legg-Perthes, allergies, patellar luxation, hemophilia and Collie eye anomaly. 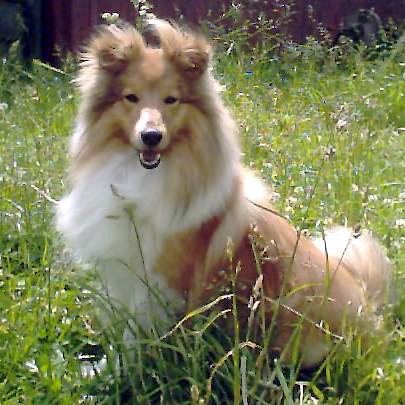 The lack of vegetation on the Shetland Islands favored smaller animals, which helps to explain why the Shetland Sheepdog was able to establish a foothold. 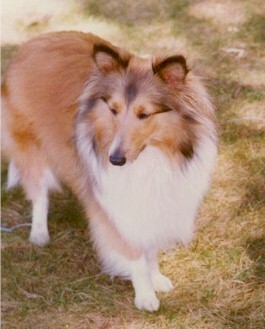 An all around farm dog, the Shetland Sheepdog was used to herd sheep, ponies and chickens.Isolated on the islands off the coast of Scotland, the Shetland Sheepdog remained relatively unknown and was not recognized as a breed until 1909, when the English Kennel Club dubbed it the Shetland Collie. In 1914, Collie breeders pressured the club into reclassifying it as the Shetland Sheepdog. 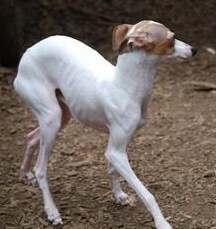 The American Kennel Club recognized the breed in 1911. 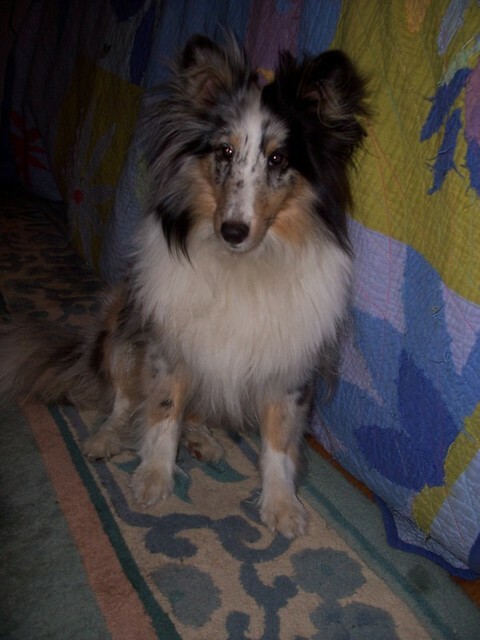 Owing to their origins as shepherds, Shelties tend to be very successful in agility, obedience and herding competitions. 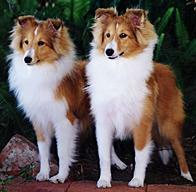 Today, the Shetland Sheepdog is one of the most popular breeds in the United States and elsewhere.Ironically, there are few Shetland Sheepdogs on the Shetland Islands; they have been largely replaced by Border Collies.